Fire Monitoring – OMEGA LTD.
Omega Monitoring offers the only solution in town that sends a fire alarm signal DIRECTLY to Kelowna Fire Dispatch personnel, by-passing the middle man and ensuring the fastest response time available. The new fire and building codes require you to have one telephone line that will last 24 hours without power in case of power failure, and one back-up line. Telephone Line: Shaw telephones are not rated for 24 hours of power, whereas Telus lines are powered, so they are not affected by a power outage. Back-up Line: The second line needs to be wireless (cellular) or internet based. We cannot use internet lines if the line/cable comes in the same way as the telephone line, so cellular is the preferred method. With our Fire Monitoring package, you will have a Telus line (tenant, fax, or dedicated) and a wireless line. 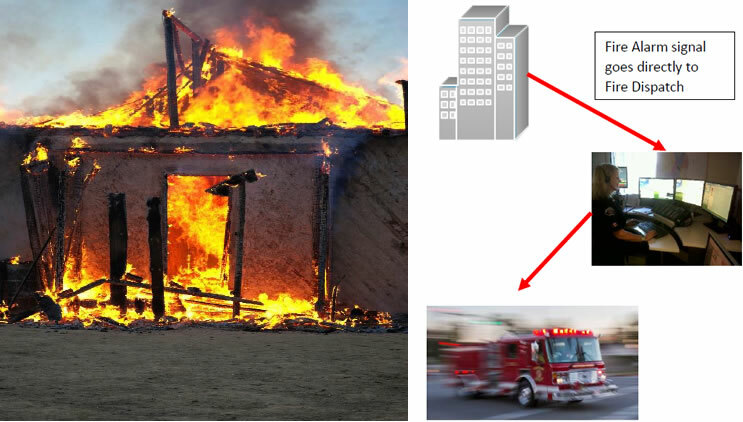 Should a fire occur, the monitoring equipment will immediately take control of the designated phone line, even if it is in use, and instantly send a signal to the Fire Department Dispatch Centre. If the fire has destroyed the main line, the secondary wireless line will be used. As added assurance, the monitoring system provides daily status reports to the fire department to ensure everything is working properly. Omega has specialized in fire monitoring since 1993. We use only the very best equipment. The monitoring is done, 24/7, at the Fire Department Dispatch Centre by highly trained, professional dispatchers who adhere to NFPA Standards for both 9-1-1 calls and direct alarm monitoring processing. While some buildings have a different set of legal requirements for fire monitoring, such as fire codes, building laws, as well as ULC, CSA, AHJ, and CAN/ULC-S561-03 requirements, our equipment is fully compliant. You will never have to question your Insurance coverage. technicians would promptly fix the system at no expense to you. Omega Fire Monitoring is the premium monitoring service available in the Okanagan and surrounding areas, largely because of its direct connection to the Fire Department. As a part of the Omega group of companies, Omega Fire Monitoring is also supported by 40 years of experience in the communications industry. Most insurance companies provide a discount to those monitored by a fire department. Because of our direct alarm connection to the Fire Department Dispatch Centre, Omega provides a faster response than any competitor. The faster the fire department is alerted, the more lives, equipment, and irreplaceable assets can be saved, and, the lower the chance of damage.